First I want to apologize for not participating in the class until now, as I deliver a first/final draft. I have been looking forward to this class for weeks, but had a personal emergency to tend to that left me with no time. When Gavin & Liz offered a couple extra days, I decided to submit my original idea. I'm sorry I missed out of comments and ideas along the way. 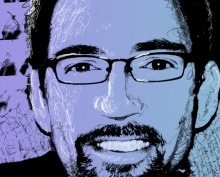 There is some great work here. 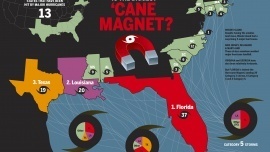 My idea was to find out which states were the biggest 'Cane Magnets, which attracted the most major hurricanes. I wanted to have some sort of magnet graphic within the headline unit, show a smaller US map highlighting the states that have been sublected to these hurricanes (amazing that is is only 13). The centerpiece idea was to actually adjust the geography of the US map to make the actual state outlines bigger or smaller depending on how many major hurricane strikes they have received. This was quite a challenge. I personally love maps and recognize state outlines, but realize most people do not. And to mess with the familiar state outlines is tricky... but I gave it a shot. Finally, 3 "hurricanes would be over water below the main map, each with a pie chart of hurricane strikes broken out by Cat 3, 4 and 5. I decided toonly color code the top 3 states and keep the others green, as it got very busy when I attempted to color code each state.